How should I introduce a “salad bowl” on a BBQ blog… There’s no meat in here so big chance most of the regular BBQ lovers won’t even take the time to click the link to check out this new recipe. Yet I believe there’s much more to BBQ/Grill than the precious meat we love so much…. 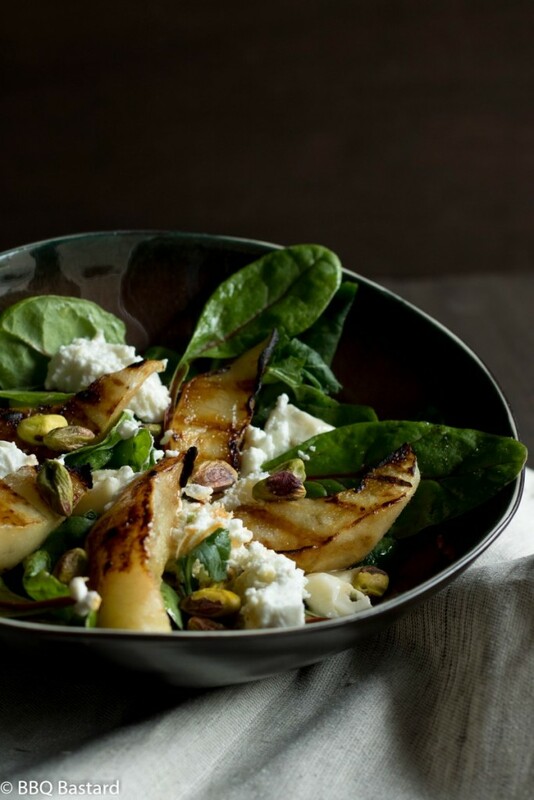 The pears in this grilled pear salad bowl to give only one example. Yet I almost missed the opportunity to prepare this salad. After a morning session preparing the evening meal, I had to go outdoors to get my fixed car at the garage. My wife almost decided to grill the pears indoor while the coals were still burning. 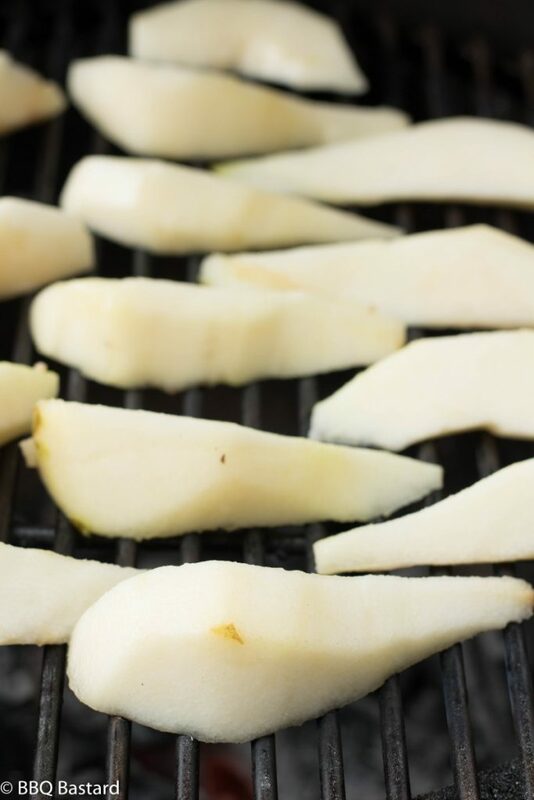 I was just in time to safe the pears from a dishonorable preparation… No seriously it would be a waste of energy not to use the BBQ when it’s still hot. Moreover it’s a charming delightful way to prepare a salad. But if you feel more about using your indoor grill I wouldn’t stop you from using it. As long as you eat this “Grilled pear salad bowl” with taste I will be happy. As I mentioned before this recipe belongs to the lady of the house. We had some blue cheese leftovers she used in her salad bowl. Since the blue cheese was rather strong, I decided to combine the salad bowl with goat cheese. I’m still learning to appreciate the strong taste of Gorgonzola as you can read in this Pizza Recipe. Both kinds of cheese combine well in this easy to make salad bowl. Actually the flavors used in the pizza recipe mentioned before don’t differ much. Yet it has a total different palate in the end. While the pizza is sweet and rather heavy, this salad is easier to digest and more balanced in flavors. Thanks for reading! If you like what you see and want to stay updated in the future, just take a moment to connect on social media. I hope to read your thoughts one of these days. 2. While the coals gain fire. Mix 4 tsp. honey with 4 tsp. pistachio oil, 2 tsp. lemon juice, salt and pepper. Put this dressing aside. 3. 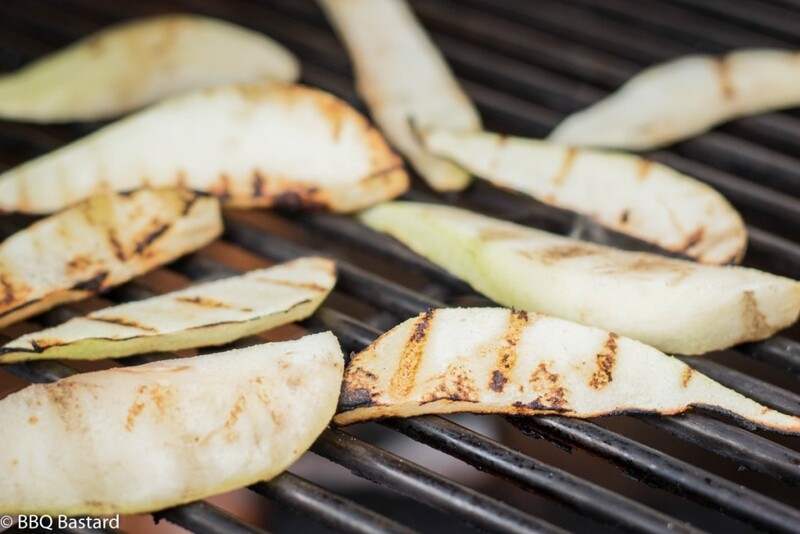 Grill the pears until you get some nice grill marks on them. 4. Mix the salad with the pistachios, toss in the cheese and drizzle 1 tsp. dressing on top of the salad. 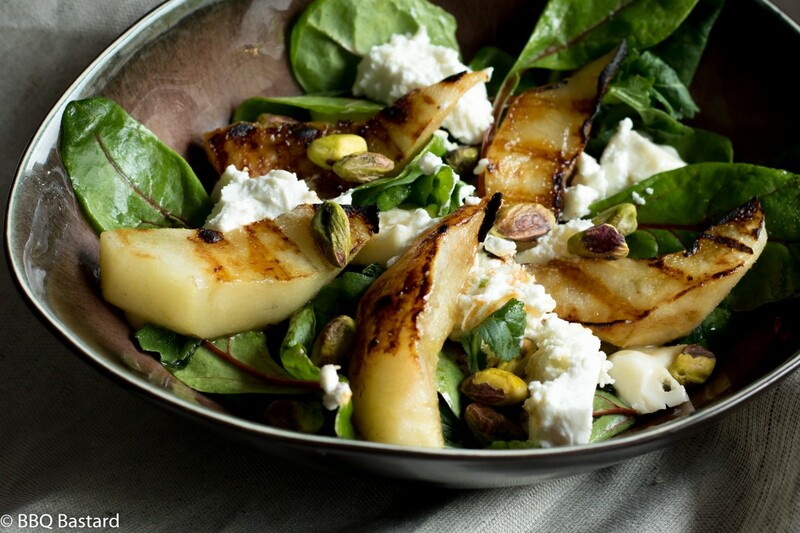 Finish the salad bowl with grilled pear. 5. Have a nice meal!